I’ve always hated the Lightning. 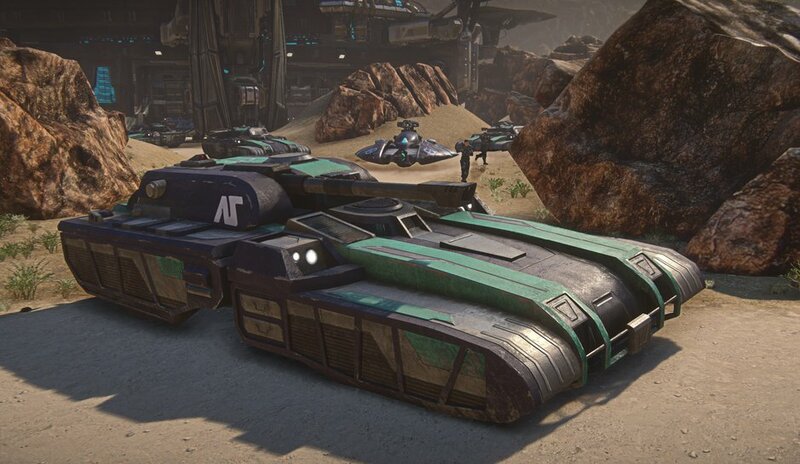 Ever since Planetside 1 I viewed the Lightning as a worthless unit. I felt it fit in a position that was ineffective – it tried to be a fast tank for recon purposes, so the description said. But it wasn’t fast enough and its tank properties were not tank enough. It was something you pulled when you were playing alone and your MBT’s respawn timer was still ticking or you didn’t have tech plant benefits. It felt the same way when Planetside 2 was released. It seemed like the Battlefield 2/3 players used the Lightning as quick transport with a bit of teeth to get to the next base. Every time the zerg would push onto the next base it seemed like there were 10-20 empty Lightnings left sitting at the side of the enemy base facing our avenue of approach. And God help you if you were on foot when the zerg of Lightning transport vehicles came rushing in – they would just run you down, slam their Lightning into a wall for a quick stop and hop out to do the infantry thing. This was the case for all three empires because I clearly remember cleaning up parking lots of empty enemy lightnings after a failed base offensive on their part. Still, there were players that upgraded their Lightning, turning it into a part of their daily gameplay. The Lightning at release was a decent infantry farming tool. Players used the L100 Python HE turret to farm infantry in droves. And then the Lightning was nerfed. Not necessarily directly. Flak armor for infantry was buffed, which greatly reduced the HE’s damage potential as more and more infantry began using flak armor. That was all months ago. After observing members from Ghosts of the Revolution use the Lightning with great success, even when going toe-to-toe against enemy MBTs, I thought about giving the Lightning a chance. Tonight was the first night of that effort. Here is what I did. I went into the VR Training and started toying with the various turrets. I found that the AP turret was great against armor – outstandingly great against armor. It was able to destroy MBTs fairly quickly. Granted all of my VR training targets are BR1, not moving and definitely not shooting at me. I found that the HE was decent against infantry but not great at much else and the HEAT was decent all-around in an acceptable fashion. So I saved up 250 cert points to buy the L100 Python HEAT. I strapped a 1.25x zoom optic on it and bought a few levels of ammo capacity. I had reinforced front armor already. Common sense told me to go with fire suppression and the rival combat chassis as that combination provides, in my opinion, the most well-rounded functionality. Out in the field, I found that my current set-up excels in slightly rugged terrain and long range engagements against infantry. At longer ranges, the infantry cannot effectively engage my Lightning. My skills and experiences with using the Anti-Vehicle turrets against infantry really come in handy because the same trajectory and leading values apply to the HEAT turret on the Lightning, which crushed the learning curve for me. Engagements against vehicles went smoothly for me, although I did not go toe-to-toe with any MBTs. I was able to engage solo enemy Lightnings, Harassers, and Sunderers without much of a sweat by using movement techniques similar to real life tank tactics. I found that using terrain to mask the main chassis of my tank exposing only the turret gave me a huge advantage. I look forward to pouring a few hundred more cert points into my Lightning to see what sort of potential it has. What experiences have you had with the Lightning? Being one of those GOTR lightning-jockeys..
Now I haven’t really used the AP gun yet, because whenever I put a specialized gun on a Lightning, inevitably all of the intended target of that gun magically vanish from the theatre. So 99% of the time I’m running HEAT or Skyguard. I’ve heard stories how the Viper actually has more DPS than the 100mm, but I dismiss those as malicious rumor. The Viper seems just equally bad against everything when compared to the lovely L100 Python HEAT. I play flanker, which the Lightning is quite good at. I have on occasion shelled an infantry push long enough to have to go back for more ammo 3 times, before they actually caught on that I was hitting them from the side. I go a totally different way from you with mods, going with Racer chassis, Smoke, and Stealth. If I start taking any sort of fire, it’s time to start moving to a different vantage. The Lightning is fragile, and not fast enough to escape its main predators, the ESF and the Harasser. Smoke and Stealth help keep you safe from your main prey, infantry. If you stop for more than 2 shots when people know where you are, you done screwed up. The trick to the lightning is to never take it into a stand-up fight, I think, unless you’ve got a ton of MBTs and Sundies in a major ground push around to attract attention away from your fragile little buns. Mechazawa, thank you for your comment. I recently switched to Racer, Smoke and Stealth as per your suggestion and I can say that it is night and day. My strategy has always been the flanker – avoiding direct engagement and providing a “support by fire” platform to help out friendlies. I often run out of ammo without receiving any fire from the enemy. The Crown has become a nest that I always try to perch from, especially when the VS are assaulting TI Alloys. The certifications that you suggested definitely help out. When I’m on the move and supporting Magriders, I still try my best to maintain the flanker. I’ll sit behind the magriders and fire over their heads or when they come to a crawl at the onset of an engagement, I’ll flank left or right to hit the enemy from their flanks. All very effective and I get a few good kills each time. Harassers are the bane of my existence. I don’t think I’ve won a single 1v1 engagement against a harasser (except that one that was seemingly AFK).